Condition monitoring is the science and practice of monitoring key information to alarm, predict and prevent problems. Familiar examples include the monitoring of the tyre pressure on a car, or monitoring the vibration of large motors in industrial facilities. Alerts and alarms provide some specific diagnostics that lead to a corrective action (i.e., for a car, pump the tyres with air), which leads to improved results and operation (i.e., fuel efficiency, reduced tyre wear and safer driving in wet weather). The potential for improvement is great. Most industrial facilities are only leveraging a small fraction of the available process and equipment data, while many problems lie hidden in plain view. Large, expensive equipment can receive a lot of attention, while smaller, less expensive equipment is not monitored as closely. However, it should be, as up to 30% of control valves, for example, can improve process performance with minor repairs or upgrades. Sensors are everywhere. For example, a new car today can be equipped with small cameras to detect passengers in seats, and pinch sensors on the door jamb. Sensors can detect pedestrians or cars moving into the car’s path, and a multitude of other events. This level of sensing was not possible 10 years ago. In many downstream plants, the levels of sensing technology used has also skyrocketed. Far from the old 4-20 mA world, smart instruments and valve positioners have added sensors for temperature, air pressure, vibration, etc. to all corners of the plant. When used properly, the monitoring of these added sensing points can identify the true root cause of problems faster and more accurately than a team of engineers. Therein lies the potential for a great step forward in Overall Equipment Effectiveness (OEE). But first, we need to find a low cost, simple way to gather the right information, filter it, and suggest the proper corrective action to the right person. 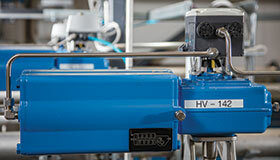 Fortunately, most hydrocarbon processing facilities are already connected to this vast array of sensor information via fieldbus and other smart networks. The data comes into the control system, and is sometimes passed along to an Asset Management System (AMS). But often, it is not. A low cost approach will extract the data via Open Platform Communication (OPC) Object Linking and Embedding (OLE) for process control, and feed it into software systems that have been designed for diagnostics and alerts. Almost every modern control systems offers an OPC server, or can feed data into an OPC-capable process historian. Diagnostic solutions, such as Metso’s PlantTriage system, can perform the diagnostics and alerting for a fraction of the cost of an unplanned shutdown or quality incident. Even traditional ‘dumb’ 4-20 mA instruments can give enough data to provide important diagnostic clues to condition monitoring systems. For example, the noise levels emitted by a flow meter can change over the equipment’s lifetime. Certain patterns in the noise level can be indicators of imminent sensor failure. As a result of monitoring the noise level for these patterns, this can give an advance warning as to when to conduct a scheduled repair and replacement of the meter, and so contribute towards avoiding a catastrophic failure during production. All this newly available data can be overwhelming. One of the most important aspects of condition monitoring is the concept of filtering through the data for targeted action. In a refinery, for example, there are typically 2000 or more control loops. Each control loop has an instrument, a controller, and a valve or variable-speed pump and, after installing smart instrumentation, there will be tens of thousands of data points. The condition monitoring system must be able to analyse and filter the information, providing targeted advice to specific personnel. In this first example, condition monitoring has identified a significant new valve problem. Through technical and economic filtering, this issue was highlighted as the most important issue throughout the plant. A technician received notification of the issue and performed a field inspection of the valve. On inspection, the technician discovered that the valve actuator bolts had worked loose from the valve and in fact, the actuator was barely attached to the valve. If the problem had not been addressed then, the actuator would have fallen to the floor, meaning the valve would have failed and the plant would have suffered an unplanned shutdown, directly affecting OEE. Instead, the issue was resolved immediately by tightening four bolts and applying some sealant/surface adhesive. Low cost resolutions such as this are typical and simple to execute especially if plant personnel are paying attention to the right conditions. In this example, a plant was experiencing unplanned shutdowns as a result of material build-up in process equipment. When detected, the build-up could be easily resolved by temporarily bypassing the equipment and flushing the lines. However, direct detection of the plugging was not possible. This issue was resolved by observing the variability of flow measurement. Once plugging had started to occur, a downstream flow meter began to show erratic measurement. In this case, a customer alert was established in order to monitor the variability of the downstream flow measurement. As a result, operators now receive an alert before plugging reaches a critical state. Line flushes are then carried out, again avoiding another costly and unplanned shutdown. After many years of experience working in hundreds of plants worldwide, Metso found that process stability is affected by many small factors. Process instability can have wide-ranging impacts on energy costs, the environment and quality. In this example, a high degree of variability was traced to a control valve issue. Condition monitoring ruled out tuning and upstream process issues, so efforts were concentrated on the valve. Once the issue had been identified, the solution was to replace the valve trim during the shutdown, resulting in smoother operation, tighter control, less valve damage and improved process quality. For some, the distinction between ‘condition monitoring’ and ‘the Internet of Things’ (IoT) can be confusing, but in fact, the IoT may provide a platform for future condition monitoring applications. Yet despite this, many processing plants continue to have significant concerns regarding cybersecurity when connecting live process data to the Internet. However, until those concerns can be properly addressed, the use of ‘on premises’ systems with secure web interfaces for reporting will continue to help bridge the gap. Condition monitoring can be an effective and low cost solution to making improvements in OEE. Modern control system platforms can allow a plant and its operators access to deep and rich information from its instruments, valves, turbomachinery and other process components. Capturing these OEE improvements, however, not only requires gathering the raw data, but filtering out what is useful, providing diagnoses, and delivering accurate and targeted information to the appropriate personnel to ensure that a corrective action is taken. In this way, low cost and targeted actions can help to increase production, prevent unplanned shutdowns, and improve product quality.